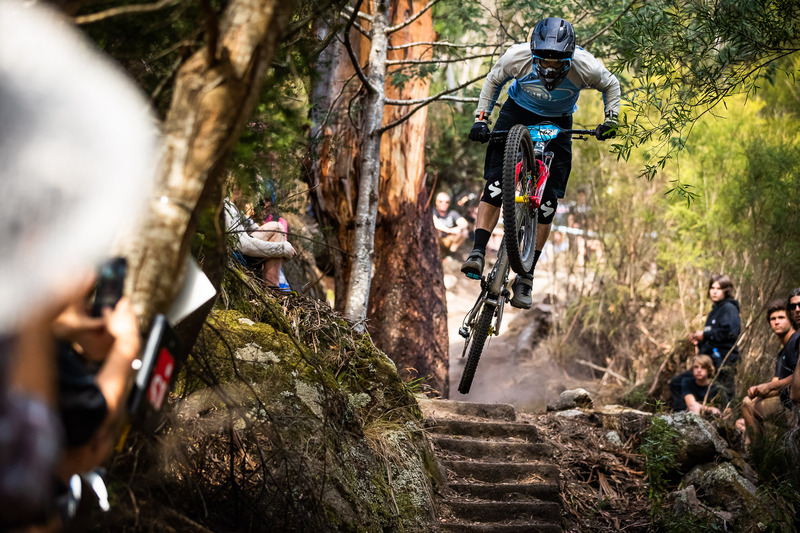 Round two of the Enduro World Series took place in Tasmania, an island south of mainland Australia, in an old mining town called Derby. It was the second time Derby has hosted an Enduro World Series round. We had heard a lot of good things about Derby but not until we got to ride the trails did we understand how good the riding was. The tracks in Derby have everything from natural sections, to massive rock gardens, to bike park sections, you name it, Derby has it all. Racing was split throughout two days, which always makes things just that little bit more interesting for the crowds and the racers. The majority of the practice was done on Friday covering stages 2 to 6. On Saturday the riders were set to do practice and race on stage 1, which was the longest stage of the race. In the typical EWS fashion, we didn’t get to race without a little bit of rain. Stage 1 also featured some gap jumps which was new to the World Enduro. The upper part of stage 1 was a natural jungle with some big rocks, and the lower part was a flowy bike park section. Leigh wanted to have a consistent race after all the drama he had to deal with in Rotorua. Having crashed just a few too many times last week, Leigh wanted to turn this around for a clean race and build up his confidence again before heading to Europe for the next round. Things don’t always go to plan, and it was unfortunate that the rain came down on stage 1 and affected the race once again. Leigh had an unfortunate crash on stage one, and it put him in the catching up position game once again. He was on the pace for a good run but taking a little dirt nap landed him to 61st position going into day two. Joe was also riding through the rain, but it didn´t affect him too much apart from drops of water on the goggles. Joe had a solid stage and was sitting in 20th going into day two. On Sunday morning the sun was out, and there was no sight of rain. Day two covered five stages and about 1200m of climbing throughout the day. The game plan for both riders was to stay consistent on all stages and have a clean race. Times were super tight on all stages, so it was hard to make up for any lost time. All the top guys are flying these days, so there is no room for error. We are thrilled that Joe and Leigh both managed to have a clean race on day two and improve on their results from day one. Joe ended up finishing in 13th position, and Leigh made it back to 35th. Overall both riders are happy with their performances, especially on day 2, we can take a lot of positives from the last two weeks and head into round 3 ready for battle in a few weeks.